We had been having decent luck with the Hunter Walking Trails so we decided to try a larger one just a little ways from Lake Winnibigoshish ( Winnie ). I thought that since this area is even a little bit farther from the Mpls area that we would see even fewer hunters. After seeing trucks at the first two areas that we had planned to hunt it was clear that I wasn’t even close to being right. We decided to just drive while the Garmin pointed us to where it said that there were some clear cuts to hunt. ( I purchased the maps and data files from http://www.northwindenterprises.us/habitat-maps-listing.html ). The first spot Tony decided to hunt it with his two dogs. 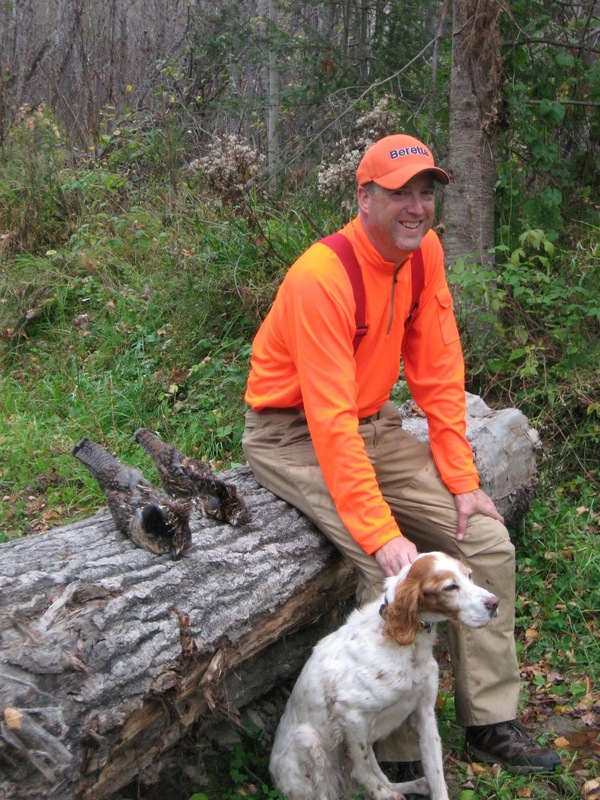 He wanted them to get a chance to focus on birds and not other hunters and dogs. He ended up taking two birds from this spot. The first trail that Mark and I tried ended at a beaver pond so we made a quick trip farther up the road to another trail. After about 5 minutes on this trail Tina got birdy. Two birds got up from the left side of the trails. Mark shot left and I shot right. Neither one of us connected. We worked the trail a bit longer and then made our way back to meet up with Tony. The next area Mark went with Tony as he had had some luck and we had hunted together earlier in the week before Tony arrived. Marge and I went down another trail that looked promising. We made it all the way through and area of good looking cover without any action. I was starting to daydream as we went through and area of older habitat when Marge locked up in the middle of the trail. I started to scan the area for the most likely location and settled on some scruffy looking cover to the right when out of the more open older area to the left a bird came up. I was able to connect on a straight up shot and as I fired a second bird launched and I was able to bring that bird down also. A third bird also flushed but I was making sure I had the first two marked so I didn’t take another shot. We continued on the trail and didn’t see any other birds. When I connected with Mark and Tony I found out that they had not any any more success. The third area we decided to work it together. A short distance down the trail Quetico went on point and Tony connected on a woodcock. Quetico had to chase down the bird as it wasn’t too well hit. He made short work of the chase and soon the bird was in Tony’s game bag. This woodcock proved to be the trickiest woodcock we’d ever come across as he got out Tony’s game bag two times before Tony decided to finish it off. A short while later the dogs started to get birdy as we approached a grassy area. Two birds took off. The first went up the trail and then banked left no one connected on this bird. The second bird went to the right and back towards us. Tony and I both emptied our guns and I saw the bird go down after my third shot. We marked the bird down and made our way towards it. I called Tina over and Tony brought Quetico and Stone over. We looked for a good period of time and I couldn’t find it but Quetico kept working the area and finally found it buried underneath some brush. Tony said the bird was hard to pull from the brush as it was biting on a stick at the bottom of the pile. We decided that it was Quetico’s bird since we wouldn’t have recovered it without him. We worked our way back to the truck without any more action. Once back at the cabin I prepared a shore lunch style dinner of crappies and walleye that my dad had caught earlier this summer.